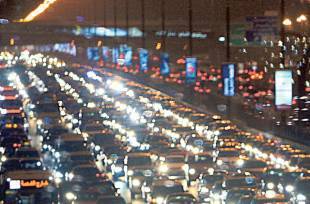 Dubai: Nearly 1,600 traffic accidents were reported in Dubai during the Eid Al Fitr holiday, according to Dubai Police.Colonel Khazraj Majid Mohammad, Deputy Director of the Command and Control Centre at the Dubai Police Department, revealed that the centre received 24,838 phone calls during the Eid Al Fitr holiday and reported 1,598 accidents which caused mild to severe injuries. According to the official, the accidents were caused by drivers not abiding by road and traffic rules, driving at speed, not staying in their lanes, not leaving sufficient distance between vehicles and not paying attention while driving. Dubai Police urged all drivers to refrain from driving carelessly and to take special care when driving near residential areas, pedestrian crossings and intersections. Colonel Mohammad added that raising awareness about correct driving methods through campaigns and initiatives is among Dubai Police’s strategic objectives. First Lieutenant Zayed Al Badani, Director of the Monitoring and Analysis section at the Department of Command and Control Centre, called on drivers to only call the toll-free number 999 in times of emergency and to call the number 901 for any other inquiries regarding services provided by Dubai Police, stressing that 999 is for emergency calls only and receiving non-urgent phone calls can take away from the time of the caller who actually does have an emergency. Information on some of the services available can be had by calling 901. These include criminal and traffic related inquiries, how to obtain a good conduct certificate, how to obtain a burial permit and how to subscribe to the home security programme.Al Badani added that the operation room receives a large number of emergency-related phone calls on a daily basis that need to be answered in the fastest time possible.